A holistic approach to health uses safe and natural methods that encourage the body's natural healing abilities to bring about a state of health and wellbeing. Taking a holistic approach to health simply means considering the whole person rather than just treating a specific area of the body that shows symptoms of disease. This means focusing not only on a specific sign or symptom, but working to discover the cause of the illness and then treating the mind, body and spirit - the whole person. The goal is to achieve a state of health and well-being that encompasses the entire person, rather than just the lack of physical pain or disease. A major difference between holistic health care and conventional medicine is that holistic practitioners use natural substances to treat illnesses and disease instead of synthetically manufactured chemicals. The choices you make on a daily basis have a huge impact on your health, especially when you are making bad ones. 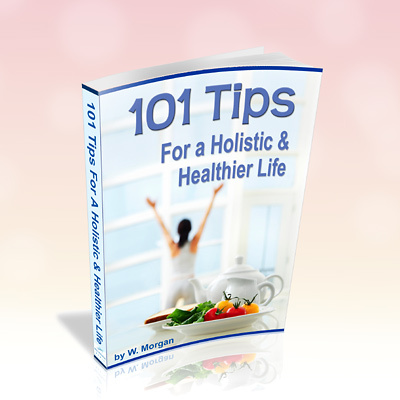 '101 Tips For A Holistic And Healthier Life' presents a comprehensive list of the easiest and quickest ways to turn your life around by adopting safe and easy techniques that anyone can use. There's plenty to choose from in this easy to read eBook, and most methods can be implemented immediately. Discover the benefits of taking a holistic approach to your life today, and begin to enjoy the wealth of benefits it brings to your health, wellbeing and happiness.